The name Grindelwald is, at least historically, German, and so pronouncing the name with a V-sound would be appropriate, which is likely why Jude Law dove into pronouncing it that way without really thinking about it. However, the fact is that most everybody else that we’ve seen say the name, even in the original Harry Potter film franchise, pronounced it with the English W-sound rather than the traditional V.
Names certainly change over time, and that includes pronunciation, so it may be that “Grindelwald” is what is technically correct come the period of the film, but “Grindelvald” is likely the historically accurate pronunciation. 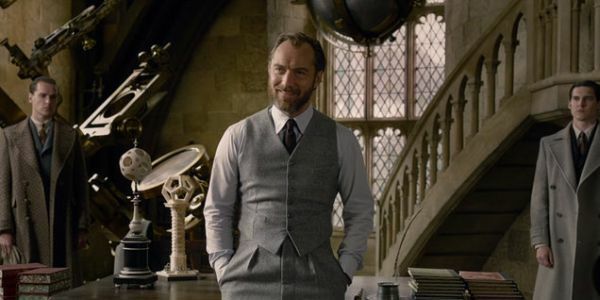 To explain away his own different pronunciation, it seems Jude Law feels that Gellert Grindelwald asks his closest friends to pronounce his name in the traditional fashion. It’s not the craziest idea. If everybody is mispronouncing your name, you probably get tired of correcting everybody all the time and just let them get it wrong. For your friends, however, you’d take the time to ask them to say your name correctly. It’s as reasonable enough a cover for the apparent mistake as I can think of. It does seem odd. If the correct pronunciation is supposed to be “Grindelwald” wasn’t there a director or a script supervisor around to make sure that everybody said the words correctly? If Jude Law got it right, then what the hell happened to literally every other person in the franchise who said the name? Maybe Jude Law gets away with it because he’s Jude Law. Hearing the way he pronounces the name certainly sounds right coming from him. Perhaps nobody wanted to correct him because it sounded so good. Check out Jude Law’s full comments from The Late Show below.